Following immediately after yesterday’s Feast of the Holy Cross, the readings today focus on Mary as she endured the “sword of sorrow” as she stood at the Cross of her son. Her sorrow reaches out through time and space to all people who have been overwhelmed by grief. May her example help us to face our moments of pain with a sure and steadfast faith in Jesus Christ. 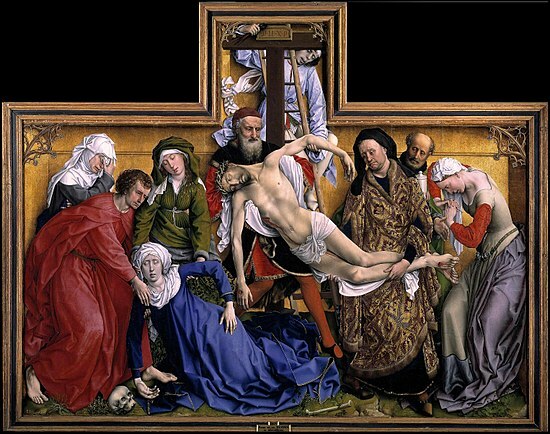 The Descent from the Cross, Rogier van der Weyden, 1435, Museo Nacional del Prado, Madrid. Note: This is one of the most moving paintings I have ever stood before. This entry was posted on Friday, September 15th, 2017 at 6:00 pm	and tagged with BVM, Catholic, Christian, Grief, Homily, Inspiration, loss, Mass, Misery, Mourning, Our Lady of Sorrows, Pain, Paschal Mystery, Sadness, Sorrow and posted in Ordinary Time, Podcast. You can follow any responses to this entry through the RSS 2.0 feed.